Most industrial spaces feature high ceiling and large working areas. But, you can utilize even more of the space available by using some of the wasted air space. You can take advantage of this extra space with Panel Built Mezzanines. The idea of a mezzanine is to provide more working space by building up. There are many uses for mezzanines in an industrial space. You can use them for catwalks, storage space or to provide an open air working office. These highly durable units are simple to install and provide a simple solution to storage and workplace clutter issues. Visual: If your workspace requires monitoring of a lot of employees and production you can use Mezzanines to provide a safe post for management and visiting clients. These areas provide an overview of the work area without interrupting the flow of productivity. Additionally, this zones create a safety buffer for unprotected visitors in the work area. Office space: If you need extra workspace but you don’t have the funds, time or area to create an additional room, consider building up. Office mezzanines can remain open or you can opt to include walls, flooring and windows for a more private, and quieter work area. Storage: Creating extra storage space is as simple as installing storage mezzanines. These wracks are durable, strong and easy to put together. Another option is to build a mezzanine for an office or walk way and utilize the under area for product or equipment storage. Custom mezzanines can double your usable space. Modular: Modular mezzanines are a simple solution to space issues. 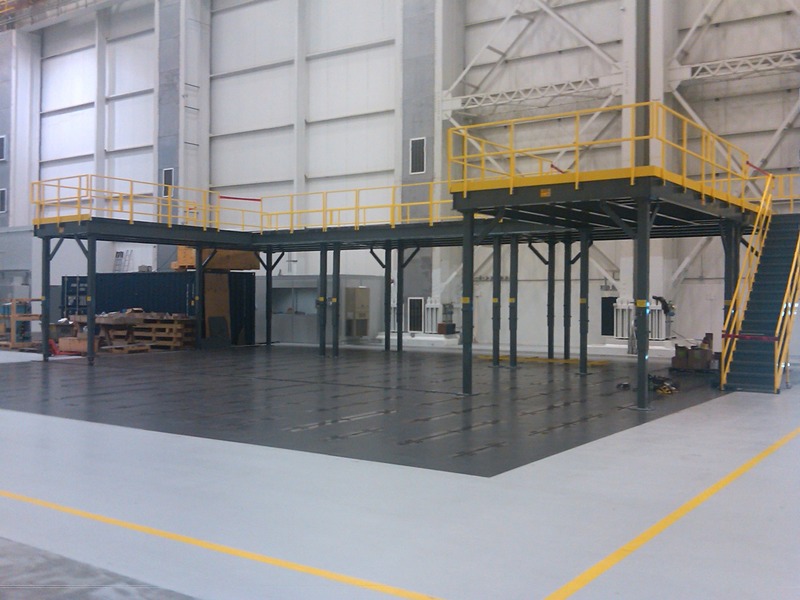 These mezzanines are prefabricated to fit into your building. Modular mezzanines include prefabricated features making a great option for businesses needed a quick solution. In addition to providing fast results, you can modify these modular units to fit your area. Each section is constructed separately and can be connected in several ways to create a personalized structure. 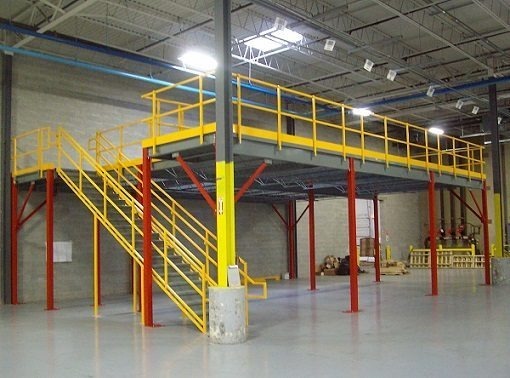 Mezzanines are a very cost effective solution for industrial businesses. They are significantly cheaper than remodeling or adding onto your work space. Additionally the use of mezzanines requires less time for you. Your mezzanine and modular offices are primarily constructed off site. This means you can keep working while we create your structure. Once the product arrives you can assemble and install your new mezzanine structure quickly. Your mezzanine will include all of the bolts and fasteners needed to ensure your mezzanine is safe and stable. Additionally, we provide detailed instructions and access to technical advisors should you run into any problems. Utilizing the free space in your building is an efficient way to use what you already have. You don’t need to add more room, you can use space you already have by creating a structure that allows you to work up. With less impact on your working environment, you can continue to produce and keep your company running nearly nonstop. Additionally, mezzanines are more durable than other building options. The steel used to create your mezzanine is designed to withstand industrial environments, inside and out. Mezzanines are easy to clean and require little maintenance. Additionally you choose grated flooring or textured flooring for areas that are frequently wet or dirty. These options ensure that you can use your extra workspace safely. Panel Built believes in safety. That is why mezzanines by Panel Built include safety rails for the stairways and walking area of the actual mezzanine. Additionally all stairways and railings meet national standards of safety, so your employees can do their jobs safely. With durable material and the highest safety codes, your mezzanine is not only a cost efficient choice, but a safe one too. If you need extra space, look up not out. Utilize the area you have available by purchasing a Panel Built mezzanine. You can hardly beat mezzanines price. By building up you can save money on construction as well as utilities. Because your new structure is utilizing your current work space you won’t have to worry about adding additional electrical, plumbing or heating units. You can customize your mezzanine to take advantage of the layout and utilities you already have access to. For more information on how a mezzanine can transform your industrial workspace, contact a Panel Built customer service representative for more information.